If you’re looking for a lightweight laptop, in this guide, we’ve rated and compared seven different compact laptops across a range of categories and price points to help you make your decision a bit easier. While it is true that, in the world of computing devices, smaller means less performance, it is also true that, nowadays, even smaller devices are capable of delivering some serious performance. That means that, if you’re someone who is looking for a new laptop and you place a lot of value on having a very mobile machine, you won’t have to sacrifice a ton of performance in order to get the mobility you require. And, in this guide, we’re going to go over seven of the best options you have if you need a lightweight laptop. We’ve listed a variety of options as well, including a gaming-specific laptop, some 2-in-1 options (tablet/laptop), an option for Apple fans, and some low-cost options, too. So, needless to say, regardless of what you need out of your laptop, one of the lightweight options listed below should work for you. If you’re just looking for a quick view at our top picks for the best lightweight laptops across a handful of categories, the table below showcases the options that we feel make the most sense across a handful of different scenarios. *To read more about each of these laptops, click the “Read Review »” link to hop down to our overview on that laptop. We’ve also got a few different Honorable Mentions picks down below as well, if you want to check those out. The Zephyrus is, head and shoulders, the most expensive entry on this list. If you just need a laptop for simple tasks at work or to take notes in class, you’ll absolutely want to consider another option. ASUS has gone full-bore on this one, and the specs justify the price—if you’re in the market for a lightweight gaming laptop. The Zephyrus comes equipped with a 15.6″ 144Hz 3ms refresh rate IPS display, an 8th gen Intel Core i7-8750H processor that can overclock up to 3.9GHz, a GeForce GTX 1070 GPU with Max Q Design, a 512GB PCIe solid state drive, 16GB of DDR4 RAM, and Windows Home Edition. It has an active aerodynamic system with 12-volt fans and anti-dust tunnels that maximize cooling performance, and it clocks in at 4.6 pounds and just over half an inch of thickness. Considering its case is CNC-milled out of a solid aluminum block, it’s fair to say that ASUS intends for the Zephyrus to be nigh indestructible. It has almost twice as much heft to it as the lightest laptop on this list, but that’s a small price to pay if you’re looking for something that’s portable and has killer specs. That said, the price tag is a little bit beyond the pale. This is a niche product, and it’s only particularly useful to people who really want to play video games on the go. For half the price, you could put together a better desktop gaming rig on your own. But if you’re looking for the intersection of portability and performance, you have definitely found it… as long as you’ve got some cash burning a hole in your pocket. The latest Apple MacBook comes with a 12″ LED-backlit Retina display with IPS technology in a native 2304 x 1440 resolution in 16:10 aspect ratio. Its processor is a 1.2GHz dual-core Intel Core m3 that can be overclocked up to 3 GHz, and it has integrated Intel HD Graphics. It comes equipped with one USB-C port, the functionality of which can be altered with several sold-separately adapters. It has an 802.11ac wireless card with Bluetooth 4.2 capability, and weighs exactly two pounds. If “compact” is the word of the day, the MacBook is definitely the best lightweight laptop for you: It’s only 13.1mm thick, yet sports a 12″ display and up to 10 hours of battery life. The battery life isn’t nearly as impressive as the Surface Pro or Surface 2, but it isn’t quite as bad as the Yoga, either. Its 512GB solid state drive still provides you with plenty of storage space, too, despite its compact design. In terms of neat tech, the MacBook also sports a Force Touch track pad that can sense the amount of pressure you’re applying, as well as provide haptic feedback. That could make navigating your laptop without a mouse considerably easier, sparing you the extra weight and space of carrying a mouse with you everywhere you go. If you’re looking for flaws in the MacBook, the most glaring is its lack of ports. A single USB-C just isn’t going to cut it for a lot of people. This can be circumvented, of course, with adapters and additional USB banks—but most non-Apple laptops won’t ask you to work around this problem, and will typically cost you less money. Whether that trade off is a deal breaker is, of course, down to individual preference. The Surface Pro beats out most of the entries on this list in battery life—managing 13 and a half hours on a single charge. The Surface Pro comes with a 12.3″ LED-backlit display at a 2736 x 1824 native resolution, and it has 8GB of RAM, a 128GB solid state drive, Windows 10 Home Edition and an 802.11abg wireless card. It comes with only one USB 3.0 port, and it weighs in at 1.7 pounds—making it the lightest laptop on this list. Though it is the lightest laptop on this list, and thus one of the most compact, the Surface Pro 6 doesn’t have a ton of storage capacity. So, if you need more storage, you might want to look elsewhere. The Surface 6 does also come with a nifty little kickstand for when you need to use it like a laptop, and it folds up when you’d rather use it as a tablet to write or draw. It also comes with a Surface Pen and Microsoft’s fold-up Surface Arc Mouse, making it ideal for digital artists who don’t need a lot of computing power to get their work done. If you’re looking for a powerful lightweight laptop for CPU-intensive tasks, the Surface Pro probably isn’t the best option. But if its light carry weight and tablet functionality pique your interest, it might just be the one for you! The Yoga’s price point is a little easier on the wallet than the Surface 2—and a lot easier on the wallet than the MateBook—but what you save in cash, you pay for in lessened functionality. The Yoga has a 13.3″ HD IPS 10-point multi-touch screen with a native 1920 x 1080 widescreen resolution, an 8th gen Intel Core i5-8250U dual-core processor that can be overclocked up to 3.4GHz, integrated Intel HD Graphics, 8GB of DDR4 RAM, a 256GB solid state drive, fingerprint reader, USB-C port, and an 802.11 A/C WiFi card with Bluetooth support. Weighing in at 2.87 pounds and measuring just over half an inch thick, the Yoga is extremely portable. The laptop can be flipped around and converted into a makeshift tablet, which would be excellent for digital artists if the Yoga came equipped with a stylus. Sadly, you’ll have to pick up your own writing device if you intend to use the Yoga to produce art. It also lacks an optical drive, so if you need to transfer data to the Yoga, it’ll have to be done on a flash drive or through the internet. Though its core specs aren’t terribly dissimilar to the Surface Pro, its greatest drawback by comparison is that its battery life is nearly half that of its competitor. Since anybody looking for an extremely lightweight laptop is likely concerned about battery life, “up to” eight hours might not cut it—but, of course, that’s down to personal discretion. For a traveling businessperson, the Yoga’s single charge lifespan likely won’t last through the entire work day—but if you’re a student, you may find that it gets you through your daily classes without much hassle. Though it’s the second-priciest entry on this list, the MateBook is a solid choice for anybody that needs a lightweight laptop for work or school. If you want to avoid lugging some heavy old thing to your classes or you need to maximize space efficiency on business flights, a lightweight laptop is a must. The MateBook has a respectably large 13.9″ LED-backlit screen (at least, for a compact laptop), an Intel Core i5 processor, 8GB of RAM, Intel HD Graphics, and a 256GB solid state drive. It comes with the 64-bit touchscreen Windows 10 Home edition installed. 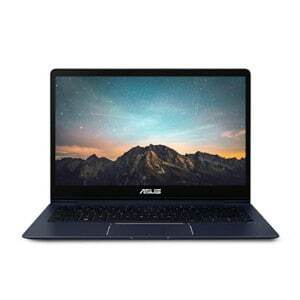 Though it isn’t quite the cheapest entry on this list, the ZenBook is one of the more compact options. It boasts a 13.3″ LED-backlit display at a 1920 x 1080 native resolution, an Intel Core i5 processor, 8GB of RAM, a 256GB solid state drive, a GeForce MX150 GPU with 2GB of video memory, and an 802.11.b wireless card. It has three USB 3.0 ports and weighs in at just under two and a half pounds. The ZenBook has a few “luxury” features, like an HDMI in and a fingerprint scanner that allows one-touch login through Windows Hello, and at exactly half an inch wide, it’s undeniably compact. It comes with Windows 10 Home Edition installed, and though it is a touchscreen laptop, it doesn’t come with an ASUS stylus. The ZenBook doesn’t win on price or specs, but if you’re looking for one of the more compact options on this list, you’ve found it. Unfortunately, its battery life tops out at about eight hours, which means that it isn’t the ideal buy for somebody that needs a full day on a single charge. Given its price point, the Surface 2 isn’t a terrible option for those in need of a lightweight, versatile laptop for use on the go. Its 13.5″ LED-backlit touchscreen has a native resolution of 2256 x 1504, and it comes with an Intel Core i5 processor, 8GB of RAM, a 128GB solid state drive, Intel HD integrated graphics and an 802.11abg wireless card. Though it only has one USB 3.0 port, the Surface 2 comes with a Surface Dock, which plugs directly into your USB 3.0 and provides you with an extra two USB 3.0 ports, two mini display ports, an audio out and an Ethernet port. The Surface 2 also comes standard with a Surface Arc Mouse, which can snap flat so that it can easily be transported in your bag or pocket while you’re on the go. Add in invisible omnisonic speakers hidden discreetly below the keyboard, a boasted 14.5 hour lifespan on a single charge, and a total weight of 2.76 pounds, and it’s easy to see how the Surface 2 could be your dream laptop if portability is what you desire most. It does come with Windows 10 Home edition installed by default, so if Pro is what you need, you’ll either have to shell out for another copy of Windows or dredge up the serial key for the copy of Pro that you already own. That said, the Surface 2 can likely handle most of the work you need to take care of when you’re out and about, and its touchscreen capabilities and standard stylus are a dream come true for graphic designers. While bigger is typically better in the world of computer and laptops, some users have need of extremely mobile machines. If that’s the case for you, you’re in luck. In this guide, we listed seven different lightweight laptop options you have if you need a powerful system that is easy to take on the go. So, if you’re in the market for a new laptop and you need it to be light, one of the options listed above should do the trick for you.